100% Tie-Off, tubular Nomex/Kevlar web, steel hooks, 6 ft.
Home / 100% Tie-Off, tubular Nomex/Kevlar web, steel hooks, 6 ft.
Capital Safety 100% Tie-Off, tubular Nomex/Kevlar web, steel hooks, 6 ft.
6 ft. (1.8m) double-leg 100% tie-off with elastic Nomex®/Kevlar® fiber webbing and snap hooks at center, aluminum rebar hooks at leg ends. ShockWave™2 shock absorbing lanyards incorporate a unique stretchable design. It offers complete freedom of movement while reducing trip fall hazards, dragging or snagging by expanding to 6 ft. (1.8m) when taut and automatically contracting to 4-1/2 ft. (1.4m) in reaction to the worker’s movements. The design is lightweight and provides added comfort and safety. The unique inner core begins to extend and absorb energy once subjected to a fall, and limits the fall arrest forces to safe levels. A built-in impact indicator provides easy visual evidence if the shock has been involved in a fall. 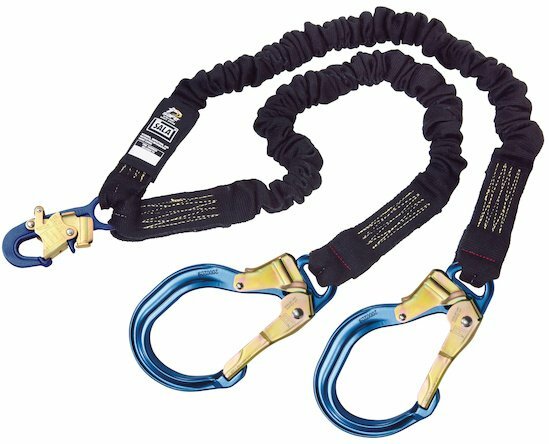 All DBI/SALA® lanyards incorporate our patented self-locking snap hooks which are widely recognized in the industry for their user friendly operation and are preferred by safety professionals and workers alike. Specifically designed to allow you to open and connect the hook without getting your thumb or fingers in the way - even with gloves on.